Ganesh rangoli designs are popular for Diwali decoration and for Ganesh Chaturthi . 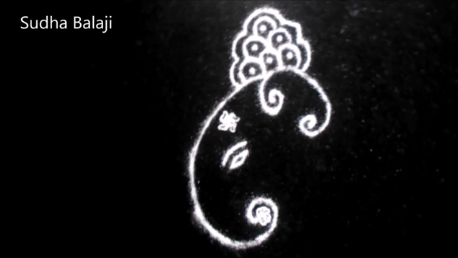 Some of the simple Ganpati rangoli designs that I have tried for these festivals. They belong to both the traditional and innovative categories. This is the tricky part in this otherwise simple rangoli , remove the bangles and CD gently to avoid smudging . If for any reason it gets smudged it is preferable to do it again instead of trying to correct it so that we get a perfect picture. After it is a small and simple design so we can complete it once again in very little time. 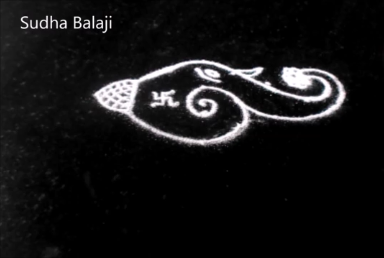 The first rangoli above shows how we can make use of the CDs and bangles to form the basic design of Ganpati. Two CDS one below the other , three bangles above for the crown. Two bangles one big and another small for the ears. After drawing the outline , gently remove the Cds and bangles. The rest is according to our imagination. Draw the eyes , tilak. We can draw the lotus at the base of the trunk so that it appears as if Lord Ganesh is carrying the lotus flower. 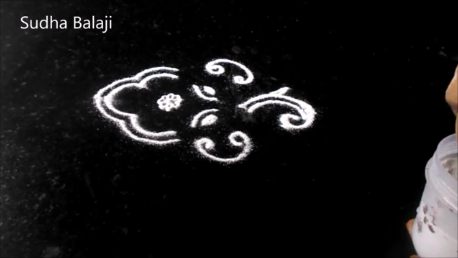 Swastik or Om symbols give a divine touch to the rangoli. We use apple or any other fruit seeds for the eyes, they are kept inside the eye designs to give a more naturalistic look. 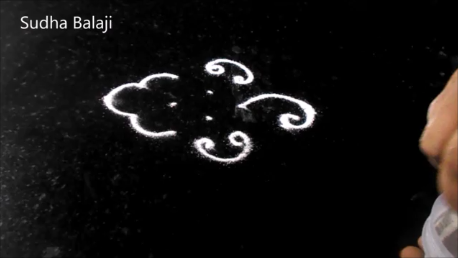 The rangoli after completion is as we see in the image below. We can use colours like sindoor for the design. The next two designs are drawn using the traditional method . I have used a 4 by 1 dot pattern. 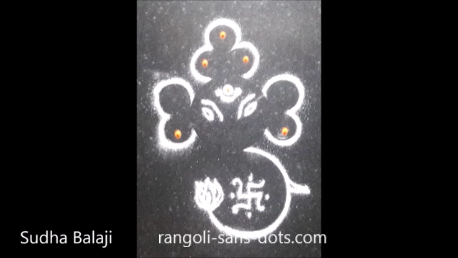 The steps show how they are drawn .With just 4 dots grid we can create simple and small Vinayak rangoli that are very beautiful too. 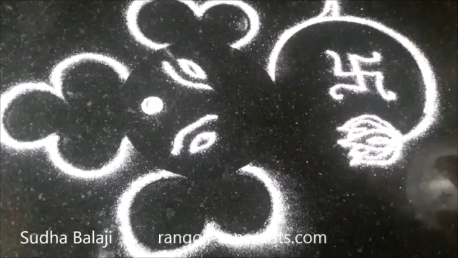 This design also uses a 4 to 1 dot grid as the next two images show how the rangoli is created. 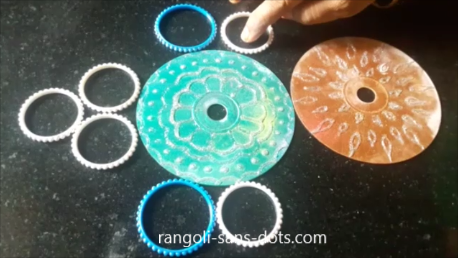 This is another simple and small innovative rangoli design using bangles and cookie cutters. Two bangles one big and small are placed as shown in the thumbnail of the video. Using two types of cookie cutters we can draw the legs, the crown and the ears. 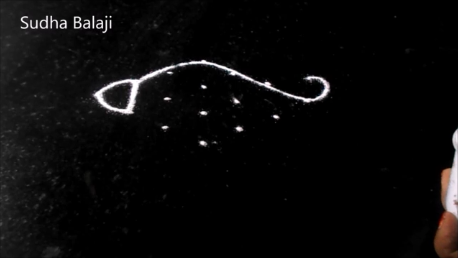 The hands can be drawn by placing dots or bullets and expanding them. Inside draw the eyes , tilak and religious symbols like Om . It is preferable to draw these designs in the Pooja room. Please do not draw them at the entrance.